Articles about prescription eyeglasses, vision, and eye conditions, mostly as they relate to babies, toddlers, and children. How Do I Measure My Kid’s PD? Pupillary Distance, PD for short, is simply the distance between the centers of the eye pupils measured in millimeters. This measurement is used to position the lens in the frame. Most kid’s PDs range between 40mm and 54mm. In order to successfully measure your child’s PD you need two things: a camera and a personal card (ID, credit card, bank card, driver’s license etc.). Any of those cards are usually 3 3/8″ (86mm) wide and it is used to compare it with your kid’s PD. Make sure your child’s eyes are on the same level as yours. Make sure the distance between the camera and the child is around 27″ (arm’s length) – see Picture 1. 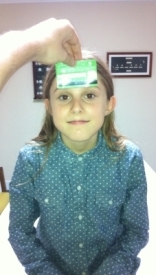 Place the personal card (back side facing the camera so your personal information is not visible) on your child’s forehead, just above the eyes – see Picture 2. Take a picture (preferably with flash). Open the picture on your computer and re-size it so the card on the screen is 3 3/8″ (86mm) wide. 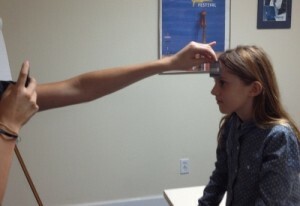 Measure the distance between the centers of the eye pupils and add 2mm (we add two millimeters because we took the picture at around arm’s length and the eyes converged). This is your child’s PD. Contact our customer service if you have any questions or concerns! This entry was posted in Prescriptions on December 23, 2013 by admin.